here’s really not much to be said when it comes to oppression. It always leaves a bad taste in the mouth. It doesn’t matter if you know the parties concerned or not. Oppression is bullying because you know that the oppressed cannot fight back either out of fear or simply is incapable of doing so. They are pushed into a corner. Nowhere to go. Completely helpless. The families of Lottie Hemedez and Angel Manalo are bullied and victims of oppression. They are being pushed to the wall. It is unbelievable how they have withstood this inhumane treatment for so long. And to think this form of oppression is spearheaded by no less than their eldest brother the “head” of a homegrown religion which calls itself the “Church of Christ” or “Iglesia Ni Cristo” is another test of comprehension that defies logic and moral behavior. With current members of this church having only one thing in mind – salvation from eternal fire – at the expense of the basic violation of a term we call humanity. Such a selfish lot of people who deserves no compassion from the heavens we understand as God. Maybe it is time we all define ourselves in accordance with what God basically represents – LOVE. And maybe then shall we understand what the opposite conveys – HATE, the Devil, and Hell. A handwritten letter by Lottie and Angel Manalo addressed to Senator Richard Gordon requesting for assistance. And all the imbeciles guarding the place who I’m sure would scatter like frightened rats and cockroaches if an actual attempt of a rescue would be initiated on the oppressed family, which is not a far-fetched possibility. I am really seething after reading and learning of this recent happening brother William. I will not say much because it will just be a torrent of expletives not suitable for publication. Instead, I will ask God how much longer will He allow this heinous, inhumane activity being imposed on people at Tandang Sora keep on happening. When will all this cruelty end? Please trust in Bro. WS’s leadership in running this blog that has become popular. Trust in his judgment. He shall continue to be accommodating and understanding. If you notice my posts, many were full of anger and not so pleasant languages; but WS still posted them. This is the venue for brethren to pour out their frustrations. Without blogs like this, where do we go? I cried reading the note from Lottie and Angel. I felt the desperation and the direness of their condition. I cannot fathom how Central can perpetrate such unconscionable and criminal behavior and how callous brethren have become to the plight of the Manalos because their religious leaders have labelled them tiwalag. How can these religious leaders face their God, cry before Him, and claim to preach His words when they are treating the Manalos worse than animals???? How can brethren stomach what is being done to these people they once put in pedestals??? No human being deserves to be treated that way, not even the scum of the earth. Sometimes, I lose my faith in the justness of God or even question how He allows such sufferings to happen??? My heart bleeds and my faith is shaken by all these. You’re not alone. Many are suffering. This EVM is even more evil than other evil and corrupt religious leaders of the world. As I earlier said, not all who were expelled or left the church would not be saved. If the reason or reasons was due to EVM and his goons, they might still be saved. There’s no guarantee that EVM, his family, and cohorts shall be saved on Judgment Day. if you ask me, the lake of fire is waiting for them. It’s truly sad and I myself so helpless how to find the real words to describe the evilness of Eduardo and his wife to conduct such satanic and oppressive act towards his own mother and siblings. I have never known such a leader of any christian church like Eduardo who was molded by his late father, Brother Eraño Manalo according to christian doctrines. This did not help him to practice this christian ways of love of one another but instead the POWER OF MONEY AND INFLUENCE WENT TO HIS HEAD. I KEPT ASKING MYSELF IF THIS LEADER OF THIS ONCE PRISTINE CHURCH IS AN IMBECILE? I don’t want to sound offensive but could this EVM be a Devil in disguise, and that he’s not the real EVM? Because many like you and me still cannot imagine that a leader of the once respected and admired church is so evil. I regret to say that the letter and request for assistance would fail. Sen. Gordon is a politician first and foremost. He might be sympathetic to the flight of the oppressed EGM family but he cannot do anything. 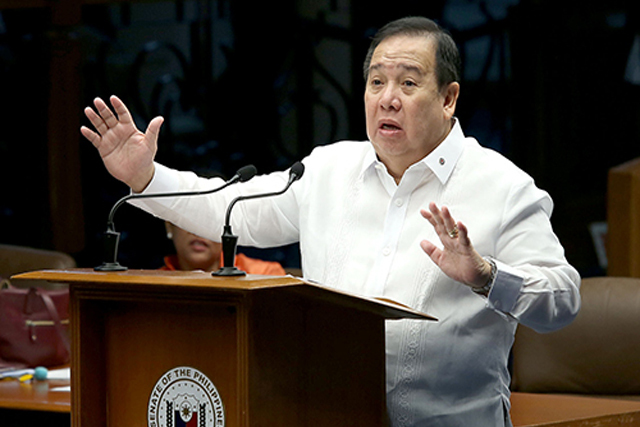 Gordon owes INC his political career way back as Mayor of Olongapo City. Even if he doesn’t agree with the current EVM leadership, he’s going to play safe by at least being neutral. We cannot also expect him to initiate a senate inquiry regarding this matter because even his colleagues in the senate who were mostly endorsed by INC are reluctant to touch on the subject. Expect the usual argument and alibi of the so called “separation from church and state”. Human Rights Commission? HRC fails in its role to protect the rights of many citizens what more concerning INC? Maybe this problem could be brought to UN Human Rights or any international body that would be more fair. it must be brought to the whole world. The Philippines is not the venue for such grievance. INC under this evil leadership continues to control the government. I’m just wondering what happened to the other family members of the ka Angel and Ka Lotie . Where are they now? Were they expelled as well? I can’t remember the circular includes their whole family. Sorry for the ignorance. As I understand, only the families of Ka Angel, Ka Mark, Ka Lottie, and Ka Tenny have been expelled. The others continue to remain in the church. They remain inside the churcj becoz??? Are they one with EVM? Di rin ba sila naaawa sa nangyayari sa mga nasa ts36? Bakit kaya? Ano kaya talaga ang nangyayari?